Banderas de los países de habla hispana. Flags of the 21 Spanish-speaking countries. 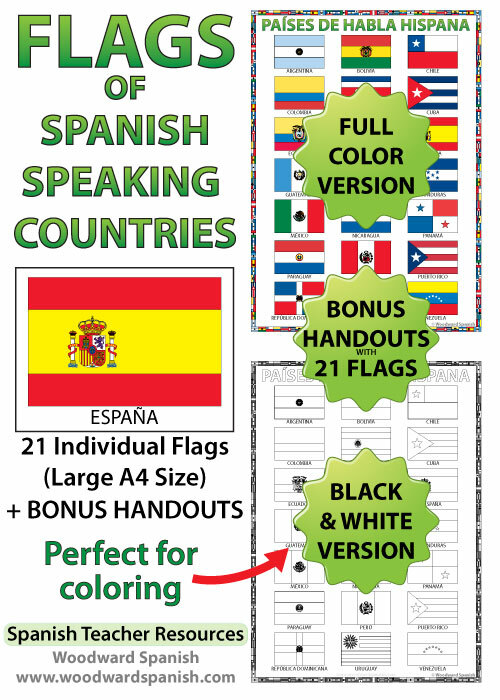 These flags are perfect for decorating the Spanish classroom. 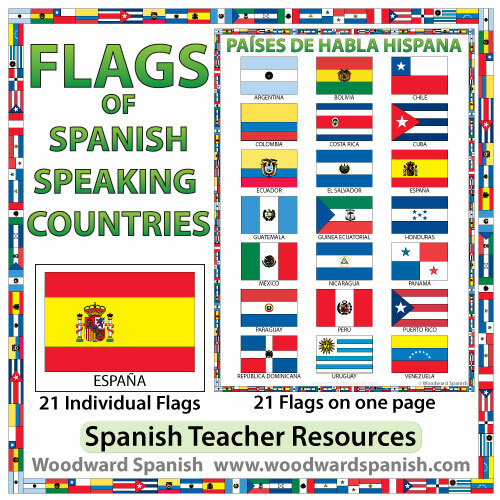 You may also want to laminate the flags and use them as large flashcards. There are 21 individual flags of the following Spanish-speaking countries: Argentina, Bolivia, Chile, Colombia, Costa Rica, Cuba, Ecuador, El Salvador, España, Guatemala, Guinea Ecuatorial, Honduras, México, Nicaragua, Panamá, Paraguay, Perú, Puerto Rico, República Dominicana, Uruguay, Venezuela. Each flag is on its own A4 size page with the name of the country below it in Spanish (with correct accents (tildes) included). BONUS: A handout with all 21 flags on one page. There are 4 versions of this handout: a full-color version (one with the names of the countries and one without the names) and a Black & White outline version for coloring (again with or without the names of the countries). IMPORTANT: This names of the countries are in Spanish, not English making it ideal for Spanish immersion classes. Banderas de los siguientes países de habla hispana: Argentina, Bolivia, Chile, Colombia, Costa Rica, Cuba, Ecuador, El Salvador, España, Guatemala, Guinea Ecuatorial, Honduras, México, Nicaragua, Panamá, Paraguay, Perú, Puerto Rico, República Dominicana, Uruguay, Venezuela.